I have a new book coming out in a few months. I can tell you what the book is about but I can’t tell you the title. No, it’s not one of those “I could tell you but I’d have to kill you” deals. Actually the reason is because it’s currently title-less. Makes it a bit difficult to promote your book when it has no title. It didn’t start off title-less. I had a really cool working title, or so I thought. However, It seems I overstepped the bounds of creativity and tried to snag a copyrited title – or at least part of a copyrited title. 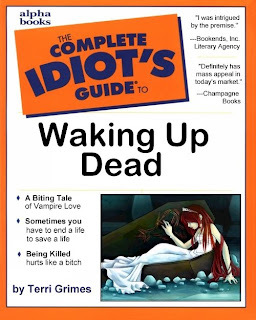 My new book, a paranormal romance about a woman who wakes up dead and hungry for blood, was going to be titled “The Complete Idiots Guide to Waking up Dead.” For some reason, the folks who publish the Complete Idiot books don’t like the idea of my stealing part of their title. It’s a shame really, because I even stole their book jacket design as a possible design cover for my book. And no, that didn’t fly either. When my new book comes out I do hope you’ll buy a copy. Just look for the book without a title.